The USDMXN is approaching a multiyear triangle’s support T/L. 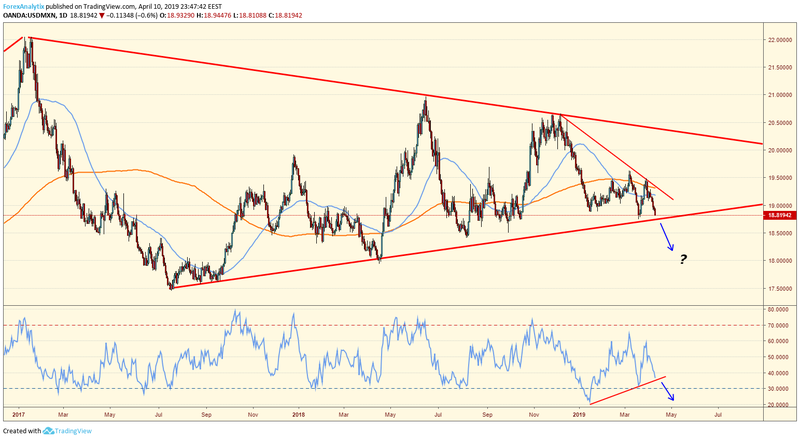 The USDMXN has been trading abnormally heavy the last couple sessions and is now at risk at a break lower out of the long term daily triangle. With NAFTA 2.0 up in the air, and risk assets (stocks, commodities, etc) continuing to rally the risk is the USDMXN breaks lower out of the triangle. The daily RSI has been divergent but if it breaks through the ascending T/L, the USDMXN may break lower as well.